This week’s Tastemaker is Coenraad (Coen) Stassen from Brys Estate. A native of South Africa, Coen is one of myriad winemakers across the continent who brings experience and knowledge from far-flung wine regions to North America. After eight years working in South Africa, Coen joined the international exchange program through Ohio State University in 2003, which brought him to Old Mission Peninsula and Traverse City, where he is now. 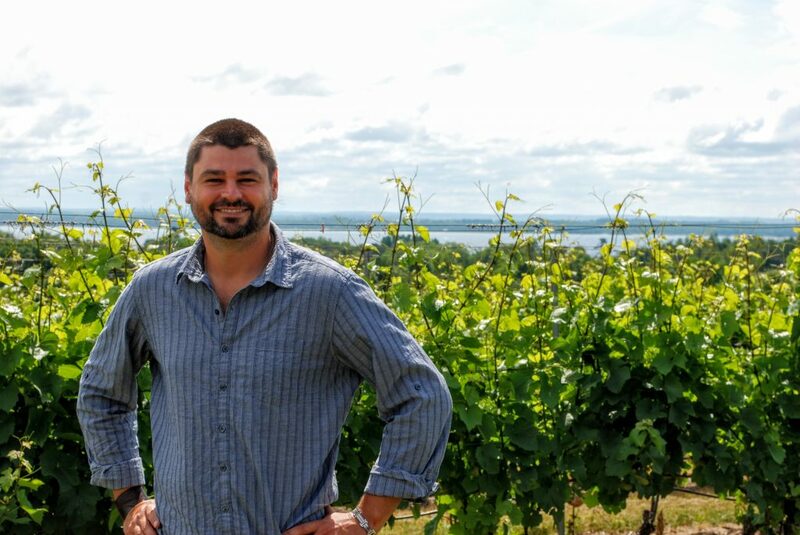 At Brys, he oversees 40 acres of vines, some dating back to 2001, and makes not only riesling but merlot and cabernet franc-based reds as well. Get to know this week’s tastemaker…. My winemaking style in 1-5 words: Elegant, Fruit-forward, crisp, balanced whites, and sultry smooth reds. First bottle of cider I remember drinking: KWV Red Muskadel (Muscat de Frontignon), 1990, Montagu, South Africa. My dad was a member of KWV and there was never a shortage of good wines in our house. How I got here: I relocated from South Africa in 2003 with eight years of winemaking experience already under my belt. I came to Brys in 2007. My winemaking style — in more words: I firmly believe the saying “Great wines are made in the vineyard” holds truth. I focus on proper viticultural practices to ensure I receive the best quality fruit for winemaking, capturing the true essence and flavors of our estate vineyards. In the cellar I have a very ‘hands off’ approach to winemaking; I allow the fruit and the vintage to dictate the style. Clean, crisp, elegant white wines and medium to full-bodied reds are my primary focus. Mentors: Most of my mentors are people I look up to that have started at the very bottom and achieved the highest level of success through hard and honest work. They have a ‘never give up’ attitude. Music playing in the cellar right now: I find the dulcet tones of Ray LaMontagne and James Bay to be the most soothing and inspirational to my wines. Favorite thing about the local wine industry: The Michigan wine industry has grown exponentially in the last 13 years, going from 45 to over 120 just since I’ve been here. Not only did we grow in numbers, but the quality in wine has excelled as well–receiving international recognition for many of our wines. Least favorite thing about the local wine industry: That many consumers are still seemingly unaware of the hidden treasure that is the Michigan wine industry…and the cruel intentions of Mother Nature that causes us to battle hard for consistency in our vintages. Even now, there’s a threat of frost as I type this. One surprising thing that I’m really good at: I am an excellent cook! My specialty is cooking over an open fire, be it outside at one of our two fire pits, or in our in-kitchen cooking fireplace. My wife and I are a culinary team to be reckoned with. This may or may not be a surprise to some, but I’m also a Black Belt in Taekwondo. My wife and I trained together. Team Stassen all the way! What I drink: I drink it all–it just depends on the time of year and/or who else is present. For example, summer calls for icy gin and tonics, bubbles, and crisp sauvignon blancs, while fall requires more serious beverages like aged ports and bold red wines. My “Desert Island Meal” — wine/cider/beer included: Cold water lobster with a delicious garlic butter sauce and a bottle of Springfield Sauvignon Blanc.